Artist Rik Erickson has been providing that "WOW!" factor to homeowners, businesses and charities for the last 30 years. 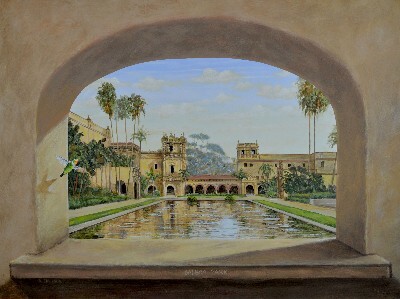 He has painted literally hundreds of murals and paintings including for the City of San Diego, US Marines, US Coast Guard, Lindbergh Field and many more. Going above and beyond by merging his artistic talent with his clients needs is his primary goal...with a long list of satisfied, repeat customers. 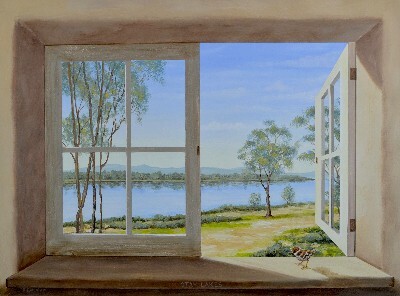 His down to earth style, vivid imagination and unique eye for detail provide years of lasting joy to those who own his artwork. 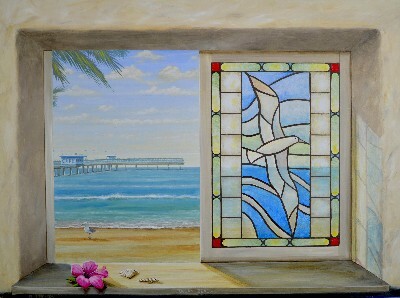 Trompe L'oeil scene looking through window at the ocean and an area of San Diego affectionately known as "O. B.". It has a small, laid-back beach town vibe. Deadheads, restaurants, musicians, activists, bikers and artists. This part of town is right next to the Mexican border and is a great bird watching area. 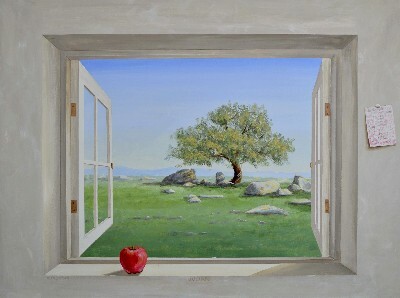 PAinting on board of tree, apple on window sill. This historic mountain town outside of San Diego area is famous for it's apple pies, hiking amongst the oaks and, in the 1870's, a big gold rush. 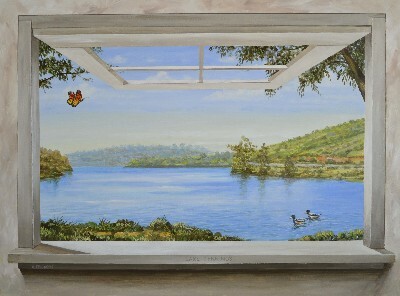 Painting on board with lake in background of Ramona area of San Diego by local artist Rik Erickson.